Taking a break from the interior for a second, let's talk about landscaping. Our house is in serious need of love outside, and with the first frost coming in about a month or so (whaaaat!?) 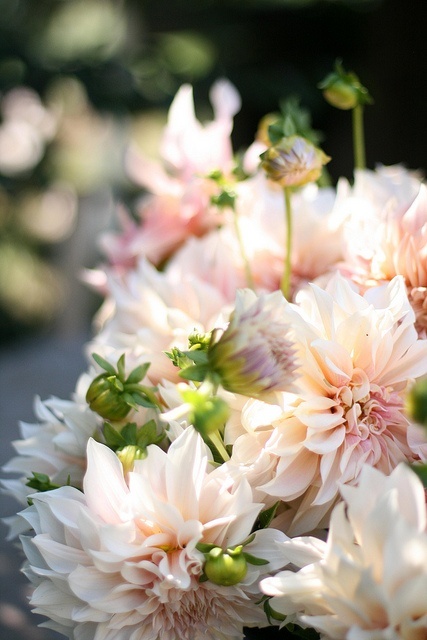 I've been sitting down and trying to learn as much as I can about what to plant and when. Originally when we first moved in, we decided we weren't going to attempt anything outside beyond just pulling as many weeds as we could before the snow falls. 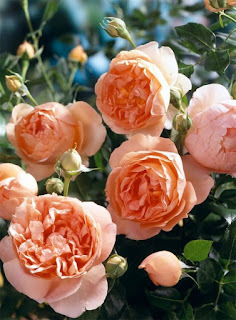 But, the idea of pretty things popping up from the ground next Spring is just such an exciting feeling, so we may attempt to plant a few things in the fall by our front porch. The previous owners weren't living in the house full-time for the last two or so years, and when we moved in, everything was very overgrown with a lot of weeds. Currently, it's a little overwhelming but I'm so excited about the potential. Thinking about landscaping and flowers, two movies pop into my head (which I know is weird, but whatever): You've Got Mail and Alice in Wonderland. So, do you remember in You've Got Mail when Kathleen says that daises are the friendliest flower? 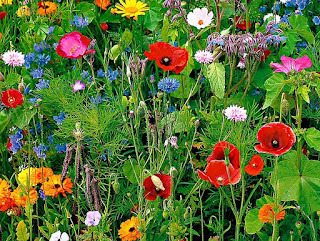 And the scene in Alice in Wonderland when Alice finds herself lost in the flower bed and they ask, "Do you suppose she's a wildflower?" That's kind of what I want the outside of our house to be like: Friendly with daisies, garden-y with wildflowers and spurts of lush, fluffy peonies, dahlias and garden roses. The fluffy is imperative, right? 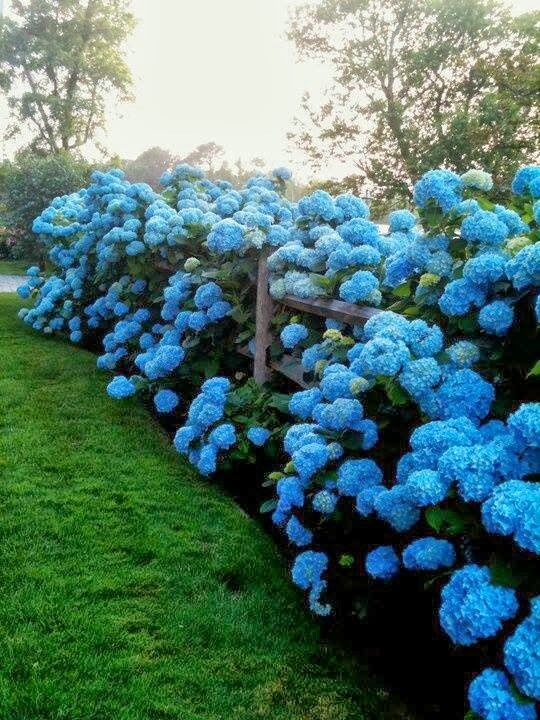 :) And, to bring in our love of Cape Cod, we eventually want to line our driveway with hydrangea bushes. 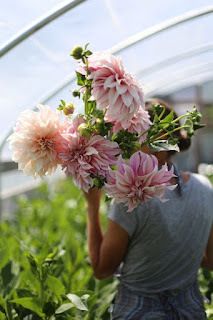 While I'm still keeping track of what areas of our yard stay sunny the longest, and which ones provide shade, and still getting an overall plan in place, I've put together a lot of inspiration on Pinterest that I thought I'd share with you today. And there you have it! 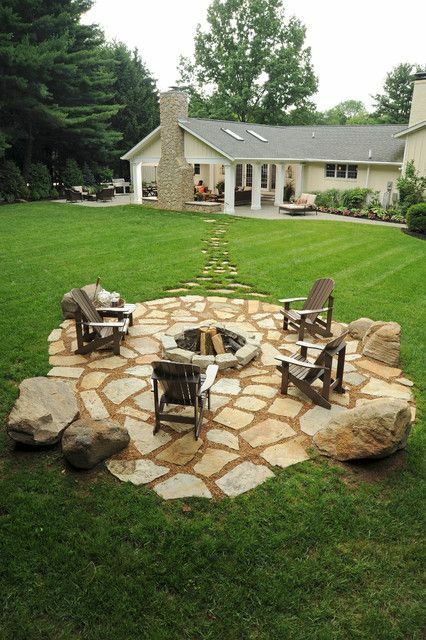 Our landscaping inspiration. 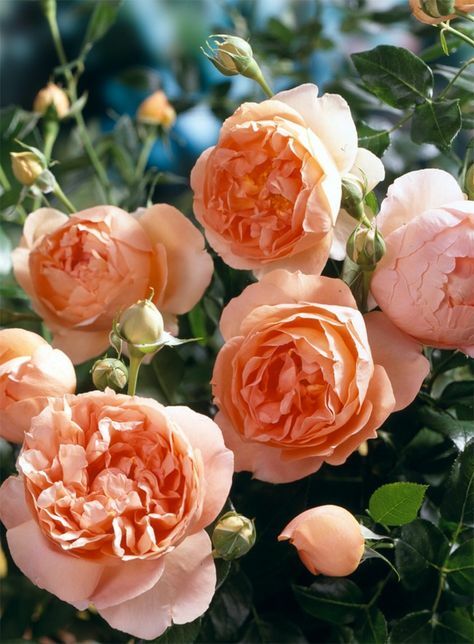 If anyone has any gardening tips or advice, I would love to hear it! I'm ready to get my hands in the dirt. Once we had the cabinets primed and painted, even though we couldn't use them for another couple of weeks, it was such an amazing feeling. Partially because it brightened the kitchen up as much as I was hoping, and partially because I was so tired of painting them. Even our dishes and drinkware look happier, amiright? And now that they were done, it was time to start working on the doors and drawers. I started with the drawers because, well, they were easier, and I wanted something easier. Since no one would ever see the very backs of the drawers, I didn't paint them. And I decided to stand them up with the backs against the floor so I could paint them in their entirety without needing to let one side dry first. Those were actually pretty easy. Then, we had the doors. The doors were trickier because they had some moulding work and dips in the fronts that would require brush work since a small roller couldn't get into those space. I was also really worried about brush marks on the fronts of the doors since they're what would always be the most visible in the kitchen. I used the roller as much as I could, and used high-quality brushes and light strokes to decrease the chances of visible brush marks as much as possible. In the end, it worked well. It helped that our paint was self-leveling for the most part. I plan on doing a post about the importance of good brushes and tools - they seriously made all the difference, despite my skepticism at first. The real trick, since this project was taking way more time than I originally planned, was figuring out a way to paint both sides of the doors on the same day without waiting for one side to dry and cure before starting the other. Waiting for that would have extended the project by at least two weeks, probably more. We watched a lot of YouTube videos, and read a lot of blogs, and the system we liked the best used old wood boards with nails hammered through to create little door stands. This allowed us to balance the doors on the tips of the nails after being painted so we could do the other side immediately after. The nails tips are so small that once the the doors were dried, you couldn't even see them. This was a time investment up front to create the stands, but in the end, I wouldn't hesitate to do it this way again because once we had the stands assembled, it made the rest of the project go so much faster. 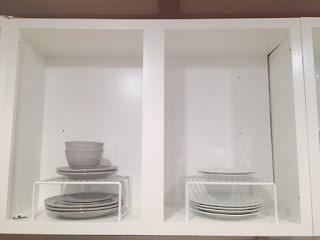 Plus, we used the ugly moulding that was at the tops of our cabinets for this project, which saved us some money (not that scrap wood is expensive at Home Depot, but ya know). 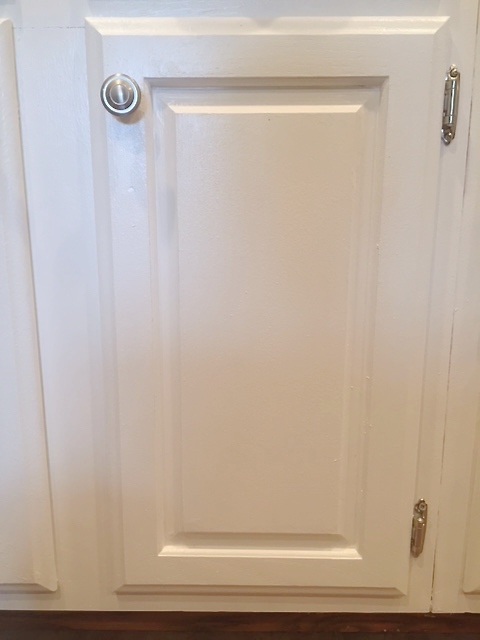 We were able to prime and paint all the doors in about three to four days. We finished right before we left for vacation mid-July, and just let them sit and cure while we were gone. When we got back, it was time to put the hardware on, drawers back in and the doors back on! 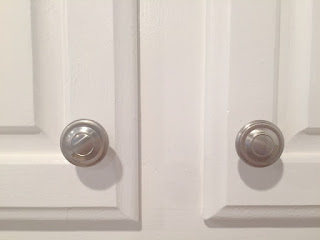 When we decided to paint our cabinets, I had my heart set on hidden hinges with a soft close function. Silly me, thinking that wouldn't be a problem. 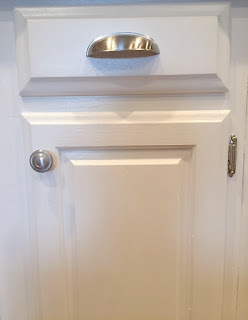 One trip to Home Depot later, and we realized that with our cabinets, doing hidden hinges would be a huge hassle (something to do with the size of our doors in proportion to the cabinets - I don't really know, I blanked out after hearing it would be a fiasco and a half). So, we ended up going with exposed hinges in a satin nickel finish that matched our new hardware and called it a day. We still plan to install soft close on all our drawers and doors, too, and as a test, we have one installed on a random door just to make sure it would work with our hinges. But, because it's not a necessary thing, we plan to just do a few over time here and there. In the end, the exposed hinges don't bother me nearly as much as I thought they would. I don't really even notice them most of the time. We're still, STILL in the process of hanging all our doors because the new hinges required us to drill new holes on the doors (of course), BUT, once we hung the first door, it all started to come together just as I envisioned it in my head. It was a glorious moment, indeed. For hardware, we went with satin nickel, and chose cup pulls for the drawers, and mushroom knobs for the doors. The hardware we picked out was actually from Home Depot, and they're by the brand Liberty. 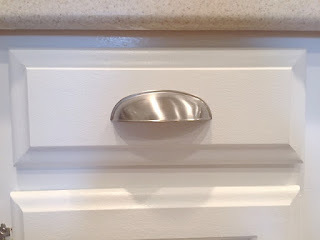 We wanted cabinet hardware that we felt worked in a country kitchen, while not being too traditional, but also not modern. I was so happy with the ones we picked, and even after spending hours and hours on other websites, searching through every knob out there, I still liked these the best, and they were someone affordable! It was a win-win-win. 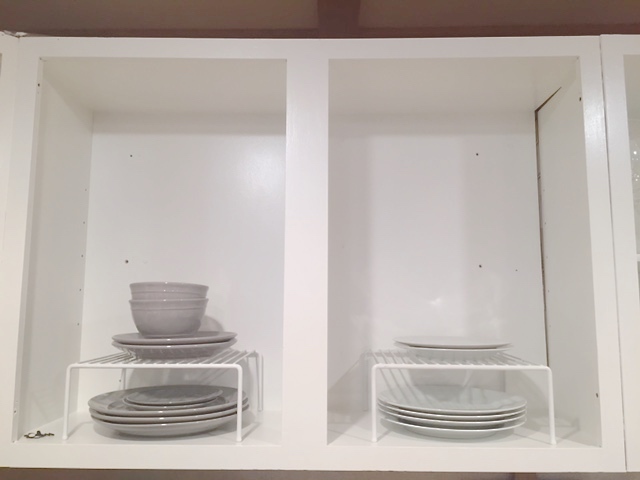 When we were able to put some of our kitchen stuff away, putting them in bright white cabinets just gave me the warm fuzzies. It was weeks of non-stop work, a period of time during which I had a general disregard for my personal appearance (I was covered in paint all.the.time) and was exhausted. But, I will say, looking back, I'd do it again in a heartbeat. I'm so proud of how they came out. They're not perfect, and I spot paint drip marks and brush strokes in some spots, but we did it ourselves. And when I think about it, while I was a grumpy cat at times, I really wasn't that miserable because I felt like I was accomplishing something beyond my skill set. And nothin' but love went into those darn cabinets. Nothin' but love. 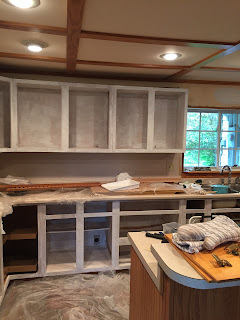 Next, I'll be able to share the overall before and after of the cabinets. While our kitchen isn't done, it'll be a good representation how the impact the white cabinets make. Yay! So, I've been dreaming (like actually, dreaming ... at bedtime) of white kitchen cabinets for going on five years now. I love spending time in the kitchen, and having a crisp, white backdrop for colorful dinnerware and gadgets makes me all kinds of giddy in the most grown-up way possible. Once our offer was accepted on the house, Josh and I both agreed that tackling our kitchen cabinets was Priority No. 1. 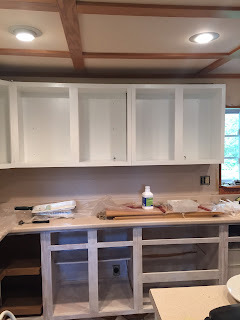 Originally, we had decided to order and install brand new cabinets, but when we saw the excellent quality of the cabinets that came with our house, and taking into consideration all the other major renovations we had coming our way in the near future, we decided to save the money and paint the cabinets we had. We took five days off of work during our move, and we thought to ourselves, "Oh, five days? 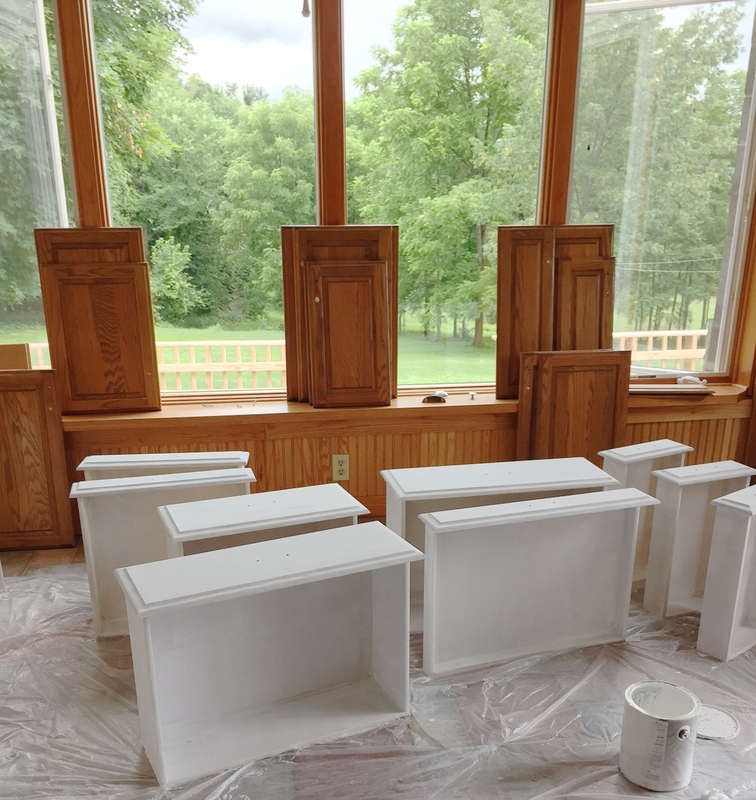 If we spend 8-10 hours each day on just the cabinets, we can totally have them painted by the time we go back to work, right?" Like ... so, so wrong. It's been eight weeks, and we still haven't put all the doors back on. But anyhoo, let's back it up. As much as I hate it now looking back, I honestly went back and forth on it after moving in. I knew it was expensive moulding at Home Depot, so I was torn. I feel like I should like it? Do I like it? I think I kind of like it? No, I don't, it needs to come down like yesterday. So down it came. 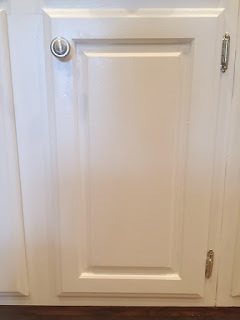 Thankfully, we were able to reuse it as a surface to paint our doors on (I'll touch on that in part two). I knew going into this project what it entailed. I knew there were a lot of prep steps before I even picked up a brush. I knew we had to prime first and then paint. I knew it would take a lot of time. But I totally didn't realize it would take as much time as it did. I think this was due, in part, to the fact that I underestimated the size of our kitchen. When the cabinetry was really dark and the space is dark, the room felt smaller. I counted our doors and drawers and knew how many we had, but I didn't realize how high that number was until I started the process. 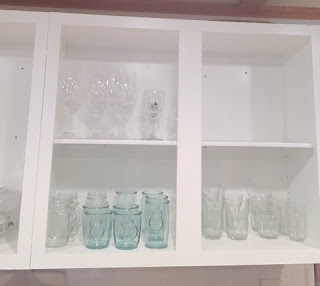 I don't have photos of the steps we took to prep our cabinets because, for the most part, I was miserable and dropping F-Bombs and was so not in the mood to be documenting anything (I'm being a little dramatic. I wasn't really like this until the very end). What I can tell you, however, is that we took all the necessary steps everyone recommended, and I felt like it wasn't all crucial. Instead of using harsh chemicals to deep clean our cabinets like most people recommended, I opted for Tack Cloth and a 5-In-1 Painter's tool. I started with the painter's tool to get all the gunk out of the crevices of the doors and cabinets. Everything I read about this step warned me that I'd be overwhelmed by how much crud would come out of the crevices, especially the doors. I scraped those suckers pretty well, and I only got small amounts of dirt. I tack clothed everything, and while my cloths were darker after each one, they weren't all that bad. I got lucky because our cabinets were really not that dirty. I was so glad I opted to skip deep cleaning with chemicals. I'm sure it would have cleaned them a little bit better, but, after sanding down everything anyway, I really don't think it would have been necessary at all. And that brings me to the sanding! This was, by and far, the worst step because not only do you have to sand, you have to clean up the sand residue. The tutorials online make it seem so easy. Oh, just grab your vacuum!, they say. Super fast and easy! Well, my friends, unless you have a Dyson, that will be an epic fail. Our average person vacuum really didn't help much. It got some of the debris, but left behind about 60% of it. So, I had to sand everything (all the cabinets, doors and drawers) and then clean up the sand with dampened paper towels to really get everything off the cabinet surfaces. It was awful. That alone took me about 12-14 hours to do all the cabinets, doors and drawers. Then, finally, we could start priming. Once we swiped that first stroke of primer on, and we saw the impact the color had on the cabinets, it was making every painful second worth it, ten times over. 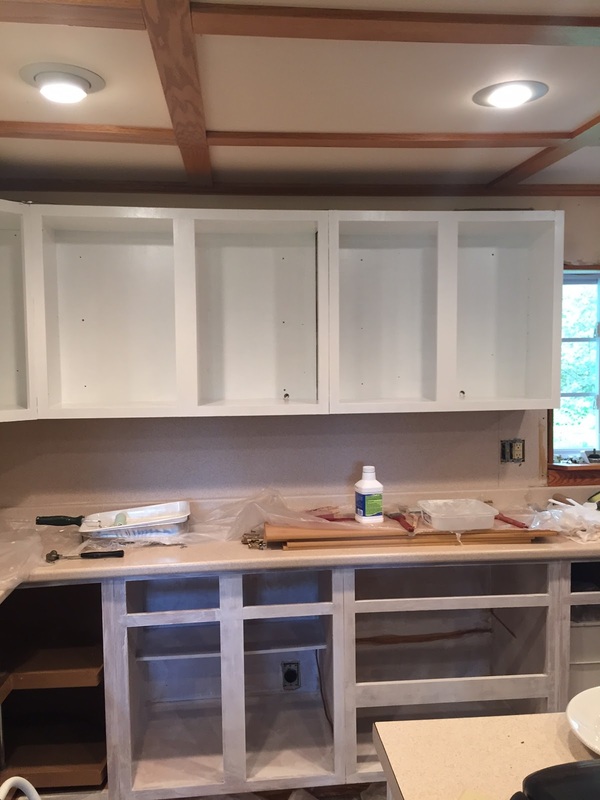 We decided early on that when we started this project, we were going to start with the cabinets attached to the walls first, so that while we finished painting our doors and drawers, we could at least start to store things in the cabinets to have a somewhat functioning kitchen. The cabinets were dark enough that even with primer, they still looked dark and I wasn't comfortable enough putting on the first coat of paint. Two primer coats was perfect for my comfort level because they evened out the surface a lot more to where I felt comfortable that the paint would apply evenly. But then, of course, you have to let them cure. 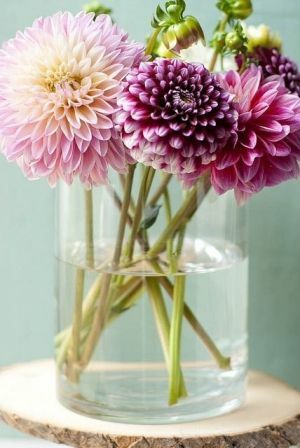 I originally thought to myself, "Oh, they'll need a day or two, then we can put all our pretty, pretty plates away and have a somewhat functioning kitchen. Yay!" No, no yay's just yet. Oil-based paint is supposed to cure faster than latex paint. However, because we were putting heavy items on them, the overwhelming majority of people online recommended letting them cure for at least two weeks. Greeeeeeat. So we didn't actually put things in our cabinets until a month after starting the project. But, it's all good because that meant more pizza takeout, because oh darn, our kitchen is still a mess and we can't cook. That made for one very happy Sam. And that, my friends, is our cabinet painting experience/naivete, part one. Part two, I'll share my mental breakdown over painting doors and drawers, and how it was all worth it in the end. Then hopefully I'll be able to reveal the new, painted cabinets. Good times, yes? Yes. So, we bought a farmhouse! After two months of living here, I still have to pinch myself that this is my life because I've been dreaming of it for years. But let me rewind a bit. My name is Sam, and with my husband, Josh, we bought this house in the summer of 2015. We both grew up in Upstate New York (me in suburbia and him a little more country), and for the better part of our lives together, we lived in Chicago. For years growing up, I was convinced I was destined for city life. I wanted to go to college in Manhattan and pictured myself a stubborn old lady who refused to leave her brownstone walk-up building, juggling a power-filled career in journalism or publishing or something else fancy. About a year into our relationship, Josh and I wanted a city adventure, and without jobs or much else lined up, we packed our apartment in the Hudson Valley of New York, and we moved to Chicago. City living was wonderful, and I'm always so grateful we took that risk and shared it together. But, after about two years in Chicago, I felt like a part of me was missing, and thankfully, Josh felt the same way (though, probably not as much because I tend to be a bit more dramatic). I missed nature, trees, birds chirping, fresh air, yards and green things in general. I was surrounded by gray and concrete, and while we had beautiful Lake Michigan right next to us, it just wasn't enough. We had to drive for hours outside the city to do things I never realized I loved so much like nature walks and hiking. And being around so many people all the time - oh, the crowds and lines everywhere! It just wasn't for me, and this surprised me. I had changed a lot since my disgruntled teenage days and I had finally realized the kind of person I was meant to be. 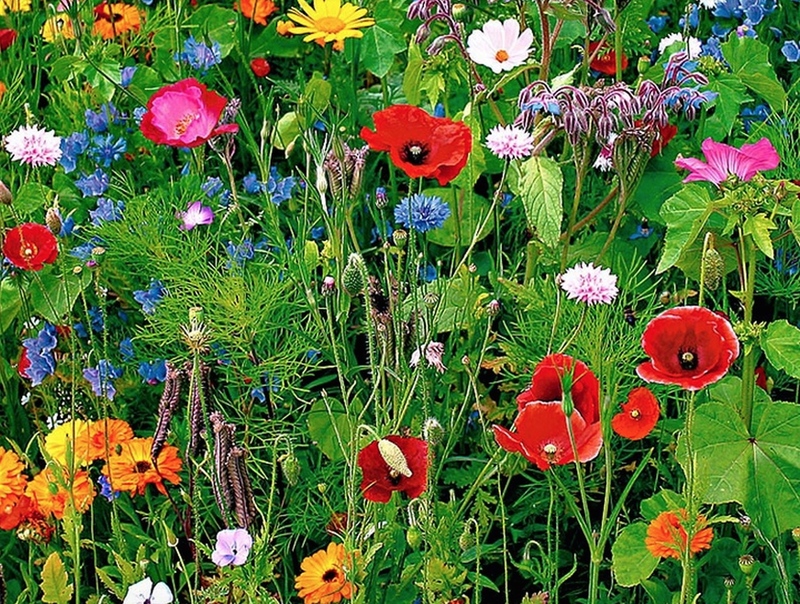 I wanted to feel connected to nature and have a more slower-paced life enriched with the wonderful things Mother Earth gives us every day. I was, in fact, a country girl. Don't get me wrong, if you saw my nail polish and make-up collection, you'd also know that I loves me some good shopping, city-life excursions and frivolous indulgences. 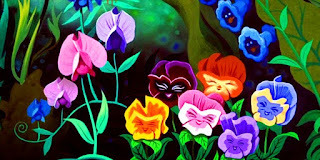 But I like to enjoy those things out in the country, while listening to the birds chirping and the bull frogs croaking. Not only that, I always felt like I was visiting the mid-West, but it wasn't where I supposed to end up. I felt like a vacationer that worked every day. 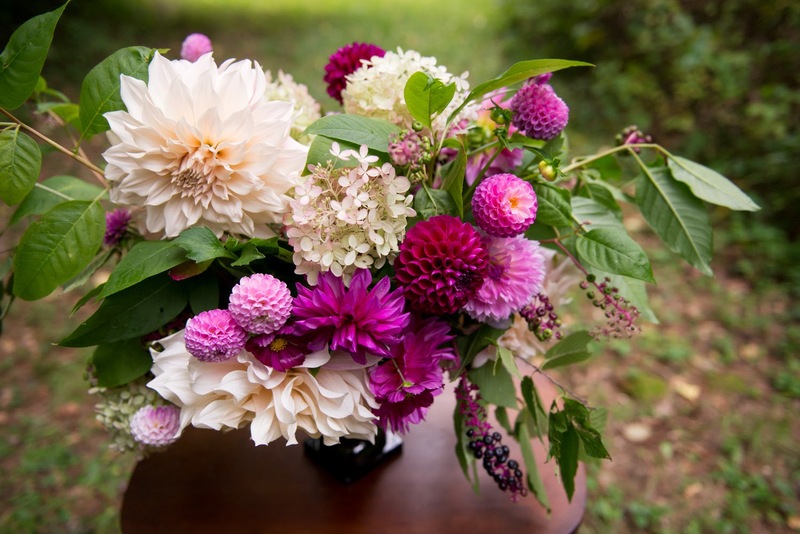 I spent so much time daydreaming about home in New York, and being near Vermont (where we honeymooned!) 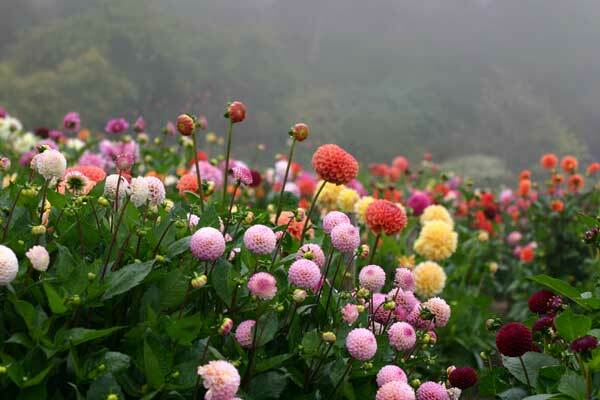 and New England and having land and apple trees, seclusion and maybe a goat or a chicken - whatever, no big deal. That daydream always brought me peace and a smile on my face. After five really great years in Chicago (gosh, I do love that city), we knew it was time to end that chapter of our lives and move on to another one. We landed in the Albany area of Upstate New York and haven't looked back since. Finding a house to call a home has been a three-year journey of really figuring out what we wanted, saving up the finances and then, finding the right house. Finding the house was a nightmare. I really hated about every minute of it. We were searching for our forever home because we were tired of moving and were ready to move into the house we would grow old in. We also knew, though, that the house we wanted, we couldn't afford unless we bought one that needed a lot of work. We didn't want to spend years making it ours, only to grow out of it, and sell it to start the whole process all over again. When we began house hunting, I had a clear vision of what I would ideally want, but I also knew to keep a very open mind. We saw house after house, the next one even more awful than the last. Seeing about 50 houses that were so far off from what we wanted was so terrifying and frustrating, and it slowly started to kill the dreamer in me each time. It's always a little soul-crushing when you realize that your dreams are just not meant to be your reality, especially for something as important as a home. I had actually come to terms with not ever finding the right home for us. I have an amazing husband and the cutest little doggie, I thought. That is enough. I'm lucky I have that. After five months of searching, we found this house online. When we pulled up to its driveway, it was the house I had built in my head already with the same front porch, weathervane on the roof, privacy for acres and the perfect floor plan. It was, literally, my dream come true. And it just so happens that it comes with a Christmas Tree Farm. AND, when I saw Josh running around the property with a huge smile on his face saying, "Is this it?! Is this it?" it was almost scary to admit this crazy dream I had was becoming real. And six weeks later, we got the keys, and this adventure began. This house is far from perfect. Oy! It has so many things that need to be renovated, tweaked, fixed, gutted, updated, painted, spackled - you name it, something in this house needs it. But, it has great bones and we love it for everything is currently has, and everything it will be once we're done with renovations (in about twenty five years). I wanted to start a blog for my own personal gratification - to chronicle the progress we make, celebrate even the smallest successes we have along the way and laugh at the epic fails that will eventually happen (We're, quite literally, just two people who bought a farmhouse with no renovation experience. I barely knew what caulk was when we moved in). I also wanted a place to share my inspiration boards, my current lifestyle loves, great house finds and everything else that may fell in between. I will likely branch out and share other aspects of my life, including beauty and skincare (to correspond with my YouTube channel), recipes and other tidbits because it all happens in this happy home of ours. And, if it just so happens that anyone else would like to join our journey, well, I would like that very much.